Wine is elegant wine, rich in matured acids with a strong aroma reminiscent of roses and linden blossoms. It is fresh and lively, with a balanced taste of apricot and peaches.Very mineralic andnice petrolium taste. The classic Riesling is distinguished by its peach bouquet and mineralization. This wine enraptures with its explicitness, sophistication and long lifespan. WINE DISTRICT: ŠTAJERSKA SLOVENIJA – SLOVENIJA VARIETY: 100% Riesling VINEYARD: Šempetrska Gorca (1.0 ha, altitude 320 m a.s.l. ), Celestrina (2,0 ha, altitude 320 m a.s.l.) 5000 vines/ha, average plant age 20 years, single guyot training system SOIL: marl soil – sheest, steep vineyard 30 – 45 % WINE YIELD: 50 hL/ha HARVESTING: hand picked WINE TECHNOLOGY: The grapes are not crashed before pressing, the juice is steel tank fermented, 4 month in steel tank, 6 month in old 2000 l oak barrals months, filtrated before bottling. BOTTLING: April 2012 WINE CHARACTERISTICS: Alc: 12.8 vol. % / Sugar cont. : 3.4 g/L Acidity: 7.05 g/L RECOMMENDED SERVING TEMPERATURE: 10-12oC WINE DESCRIPTION: Wine is elegant wine, rich in matured acids with a strong aroma reminiscent of roses and linden blossoms. It is fresh and lively, with a balanced taste of apricot and peaches.Very mineralic andnice petrolium taste. FOOD AND WINE: Recommended with all pork, veal and poultry meals, some seafood dishes. 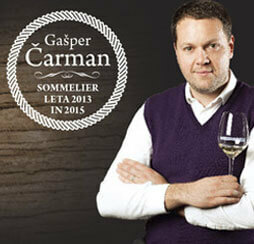 Protner Joannes wines are on the very top in Slovenia. Long tradition and hard work made Protner’s wine famous and recognisable all over the world.